These half sour pickles are easy fermented pickles. 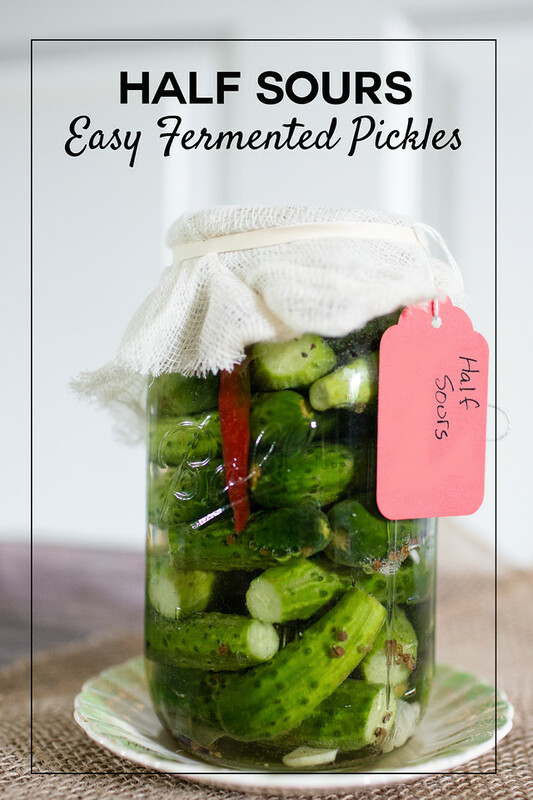 Click here to pin these Half Sours Fermented Pickles now! One of my favorite ways to preserve summer’s bounty is pickles. While most people think of pickles as the classic dill pickle, you can actually pickle a lot of different vegetables and fruits. You can also use different methods for pickling. When I have time, I love to can these Simply Good Dill Pickles. If I don’t have time to can, I like to make quick refrigerator pickles, like these Refrigerator Bread and Butter Pickles and these Winey Briney Quick Pickled Asparagus and there is always a jar of these Quick Pickled Onions in my refrigerator. There is another method of pickling and that is fermentation. Fermentation is using a brine and time to preserve the food. One that most people are aware of is sauerkraut, like my Easy Homemade Sauerkraut. You can also ferment cucumber to make pickles. The first cucumber pickle that I fermented was Hungarian Summer Pickles. If you didn’t see that post, I encourage you to go read it now. I talk about fermenting pickles and what to expect there, so I am not going to go all over it again here. These pickles are similar to the Hungarian Summer Pickles, except that they are fermented slower. They are not placed in the sun, but allowed to ferment in a cool, dark place. I found them also in The Joy of Pickling. I highly recommend that book if you plan on doing any pickling. It is loaded with information of any kind of pickling you might want to try! Once again, time and yeast does all the work for you! In about a week, you will have some delicious pickles, with hardly any work on your part! I fermented these pickles with a mason jar and cheese cloth, you can also use an easy fermenting kit. These pickles are fermented in a salty brine instead of pickled with vinegar. Put the peppercorns, coriander, bay and garlic into a clean quart jar. Pack the jar with the cucumbers so that they don't float adding the dill and the pepper as you do. Dissolve the salt in water and pour the brine over over the cucumbers, leaving 1 1/2 inches of headspace. Push a quart sized freezer bag into the jar and pour some or all of the remaining brine into the bag and seal the bag. Keep the jar at room temperature with a dish underneath for brine seepage. Within 3 days, you should see some bubbles (I saw mine later that evening!). If scum forms on the top of the brine, skim it off daily and rinse off the brine bag. The pickles should be ready in about a week. They should taste sour and the tiny bubbles should have stopped rising. Skim off any scum and store in the refrigerator for about 3 days. After that, they should be an even olive-green throughout. They are best eaten within about 3 weeks. These must ferment for about a week. Your post is featured on Full Plate Thursday this week and it will be pinned to our features board. Hope you have a lovely day and thanks so much for sharing your post with us! I love them too! Thanks for stopping by! Your Half Sours look beautiful and I can’t wait to try them! I really appreciate you sharing with us at Full Plate Thursday and hope you are having a safe and enjoyable weekend. This is amazing. I just set it aside for a few days and enjoy the delicious pickles. Mmm I think I would love the sour flavor in these! Those itty bitty cucumbers are adorable! No wonder you’re having so much fun pickling. I love the idea of jars on the counter fermenting and becoming ready to eat food. It takes me back to childhood as my folks always had a large crock of something fermenting. Sometimes it was pickles, other times kraut. And frequently home brew in basement, when we had one or the corner of the coolest bedroom. It will be fun to see your chosen recipes from this book.